Beginning in 2013, the Bill & Melinda Gates Foundation supported seven early oral PrEP demonstration projects. 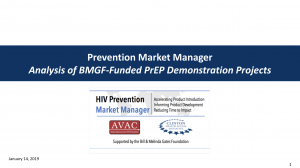 The Prevention Market Manager project aggregated and analyzed the project results to inform oral PrEP rollout and new product demonstration projects. Click below for the findings. A companion document, Lessons from Seven Early Oral PrEP Demonstration Projects, is also available.